TESSOUAT (Tesswehas, Le Borgne de l’Île), Paul, Algonkin chief of the Allumette Island tribe; d. 1654. Wintering on the St. Lawrence in 1640–41, his people quarrelled with the Christians at Sillery and threatened murder. Tessouat enticed the Christians to return to paganism. Some Sillery Christians joined him in a war-party, which met a sudden defeat after the non-Christians were in consultation with their demons. At Trois-Rivières, when Father Buteux interfered in a pagan ceremony to cure the sick, Tessouat threw burning cinders at his eyes and threatened to kill him with a rope. He later denied this intention to Champflour, the governor. In 1642, one of the two leading chiefs then resident at Trois-Rivières, he was again fomenting trouble. He forbade his people to attend mass. In November he moved to Fort Richelieu to be with others of his tribe for hunting or war. In March 1643, he arrived at the new settlement of Ville-Marie, on the island Montreal, where his nephew Joseph Oumasasikweie was then living. (Joseph and his wife, Mitigoukwe (later Jeanne) were the first Indians to be baptized and married with full church rites at Ville-Marie.) To the surprise of all, Tessouat requested baptism and a Christian marriage. His conversion was greatly prized because of his importance as chief and because of his former hostility. Great solemnity therefore was observed in the ceremonies on 9 March. Chomedey de Maisonneuve and Mlle Mance, who were his godparents, gave him the name of Paul. M de Puiseaux and Mme Chauvigny de La Peltrie were godparents to his wife, who was given the name of Magdelaine. Maisonneuve presented Tessouat with an arquebus and invited him and his wife to dine with the French. Tessouat later held a feast for the Indians, which the French attended. He expressed his gratitude to Maisonneuve, and also his desire to settle near him. Maisonneuve granted land to Tessouat and gave him two men to help cultivate it. Although the haughtiest man in the world before his baptism, Tessouat became as gentle and humble as a little child, the Jesuits recorded. He showed zeal for the faith and preached often, inclining others of his tribe to follow his example. Tessouat wintered at Montreal in 1645–46 where he planted corn, but he withdrew to Trois-Rivières, urging others to do likewise, in the face of reports that Iroquois raids were imminent. This probably resulted from his learning that the French had abandoned non-Christian Algonkins in the 1645 treaty with the Iroquois. Tessouat was described as one of the greatest orators of his time and in May 1646 he spoke eloquently for all the Algonkins at peace councils held with the Iroquois ambassadors. In his speech, however, there were overtones of suspicion and fear that the French might betray their allies, the Hurons and the Algonkins, and sign a separate peace with the Iroquois. In token of his goodwill he presented the Iroquois with 14 elk robes, handsomely painted and well trimmed. Four robes each were given to three Iroquois villages, entreating them to return with safety the children and adult Algonkins whom they held captive. Returning to his country in August, his party was ambushed. On this occasion he lost one young man who returned to Montreal with an arquebus wound, and two women, one very aged. In 1648, Tessouat was at Sillery, concerned over the prohibition of non-Christian Indians from that mission at a time when Iroquois war-parties were sweeping the country. He was there accosted by Negabamat for refusing to accept Christianity and at the time gave some hope of reconversion. Nicolas Perrot*, writing of Le Borgne or Tessouat, said that he “was regarded as the terror of all the peoples, even of the Iroquois.” He relates the story that the French priest accompanying the Hurons in the escape from their country in 1650 gave orders to pass Le Borgne’s island without payment of toll, saying that the French were masters of all the nations. 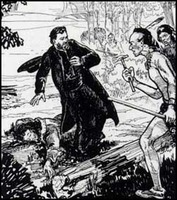 Tessouat, who then had 400 warriors at his command, forced the party to be brought before him and ordered that the priest be “suspended from a tree by the armpits.” (Perrot, however, confused the superior of the Huron mission, Father Paul Ragueneau, with Father Jérôme Lalemant, who was not one of the party.) The next year, Perrot continues, Tessouat went down to the French colony. He was carried ashore in his canoe, and despite the fact that guards never left him, he was arrested and thrown into a dungeon for a few days in punishment for his treatment of the priest. In 1654 the “famous one-eyed man,” the greatest orator of his time, died a Christian at Trois-Rivières. JR (Thwaites), passim. Perrot, “Memoir,” in Indian tribes (Blair), I, 176–78. Desrosiers, Iroquoisie, 330–31, 335; “La rupture de la paix de 1645,” Cahiers des Dix, XVII (1952), 180. Hunt, Wars of the Iroquois, 106. Elsie McLeod Jury, “TESSOUAT (d. 1654),” in Dictionary of Canadian Biography, vol. 1, University of Toronto/Université Laval, 2003–, accessed April 24, 2019, http://www.biographi.ca/en/bio/tessouat_1654_1E.html.